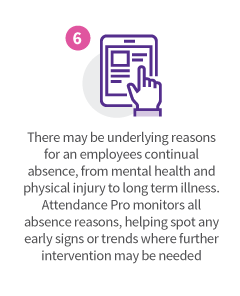 Simply spotting a workplace absenteeism trend isn’t going to help reduce your absence rates. In order to reduce workplace absenteeism rates you need to get to the root cause of the issue, and this is where our health & wellbeing provision can help you out. Luckily for you, our absence management experts are here to help your business. Our absence management systems have been proven to reduce workplace absenteeism and a key way that you can reduce this is by improving the overall health & wellbeing of your workforce. It’s now more important than ever before for businesses to invest in the health & wellbeing of their staff. A healthy workforce is a happy and productive workforce. And with the help of our absence management specialists, we can help you improve the overall health & wellbeing of your staff. This isn’t a quick fix but a long term solution to an ever growing problem that is increasingly burdening modern businesses. But, how exactly can ELAS help improve workplace absenteeism in your company? Our in house team of physicians and nurses are here to reduce workplace absenteeism. Do you have a troublesome employee who has been absent for a couple of weeks? Has an employee been on sick leave for a bad back? Is an employee going through a tough time and needs someone to talk to? Workplace absenteeism can have many complicated causes and that’s why our occupational health team are here to help! They’ll ensure your staff are fit, healthy and back in work as quick as possible. Whether you want to organise a management referral, a musculoskeletal assessment, face to face counselling or even a wellbeing awareness day; we have the solution. Our comprehensive collection of occupational health and health surveillance services ensures that no matter what’s causing workplace absenteeism, we have the solution to get your staff back in work & fully healthy as soon as possible. Still not convinced that our health & wellbeing service is the right fit for your business? Why not call our team on 08450 50 40 60 and get your free consultation to reduce workplace absenteeism! Not got time to call? Complete the contact form and we’ll get back to you! What are the benefits of using Attendance Pro? 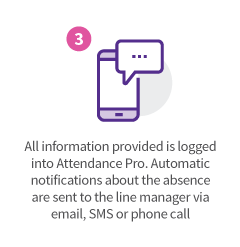 The Attendance Pro team are always there to assist us with any questions we have in relation to absence management. Staff morale has improved and absences are easily monitored allowing HR to follow up on any repeat offenders. Sickness was a massive issue for us. Attendance Pro has helped us get this under control. 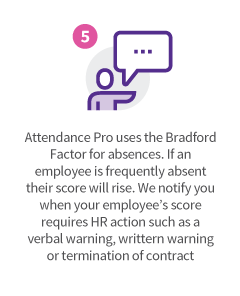 Attendance Pro has been an important resource for us as it has allowed us to keep a monitor on absence across the business. We have been happy with Attendance Pro and, importantly, seen a drop in reported sickness absence. This drop has meant more staff are available to support our customers. With the introduction of Attendance Pro over two years ago, our sickness absence has greatly reduced. I have no hesitation in recommending ELAS to other organisations. We were dealing with a growing internal problem regarding our employees taking time off due to sickness. This problem has now been resolved which has in turn saved the company both time and money. Attendance Pro is a godsend. I send an email for changes and its done. If there are queries on calls, I am sent the recordings. Attendance Pro is extra helpful and the team works really well.